just a present for all, but especially for tiler. Hot! Me likey this one alot! Hawwtness! wow....never knew Ryou could b so hot.....0.o *passes out* FLOP. You know on the show, when he was in his room? He screamed "what do you want?!!?!" I said this out loud. "I want you! And Renee! But she's not here so ill settle for you!!!" Good thing no one heard me. Heheheheh this pic is amasingly done! Manson-chan drew it too before... but yeah ^^;; I really love this piccie Thomas-chan!!! xD I LOVES it :D THankies so much!! Wow. Ryou looks hot how you draw him. 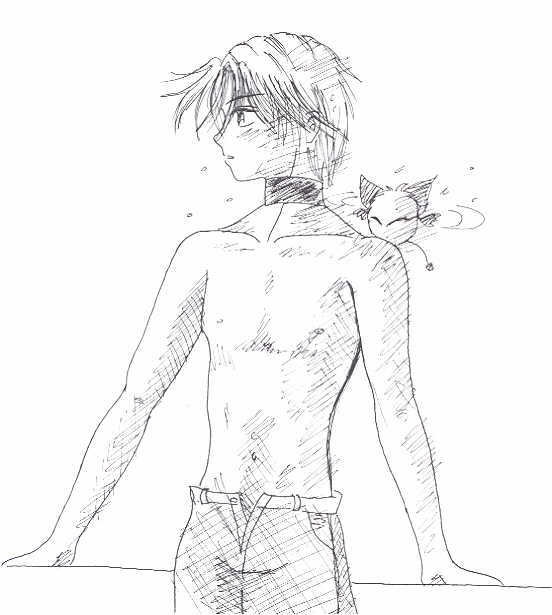 o.o who knew.... You drew him better than the mangaka!